Like a giant four-wheeled amphibian, the Volkswagen Golf periodically sheds its skin so that it can grow, emerging glistening into the light looking much the same as it did before only a bit bigger. The latest seventh generation bucked the trend to an extent, by emerging slightly leaner than expected. It was still longer and wider than before, of course, but a bit lower and as much as 100kg lighter. The weight loss is most pronounced at the porkier end of the Golf range, but down at the entry level “S” spec, with a modest 1.2-litre TSI petrol engine, the Golf 7 is still a useful 25kg or so lighter than the equivalent predecessor, despite the growth spurt that has given it a roomier interior than the Golf 6. The weight saving is not much but it helps to ensure that the engine’s peak output of 105PS and 175Nm remains adequate to haul the car around. VW’s optional DSG twin-clutch automatic gearbox pairs well with this particular engine. With seven ratios to juggle, it can make the most of the modest engine urge when acceleration is called for, and can then quickly step up to a high gear to improve economy under a lighter throttle. I certainly wouldn’t relish wrestling with a clutch and stick as often as the DSG swaps cogs, as it continually balances performance and fuel consumption. There are no paddles behind the wheel but you can nudge the central lever across into its manual slot – push for up, pull for down – though it’s hard to see the point. Left to its own devices, the DSG’s twin clutches allow for rapidly slurred gearshifts that are supremely smooth, while the response to a squashed throttle is quick-witted for what is a not-very-athletic car. Whatever “S” stands for it can’t really be schnell, but it’s not slug either. The sprint to 62mph is polished off in just 10.2 seconds. 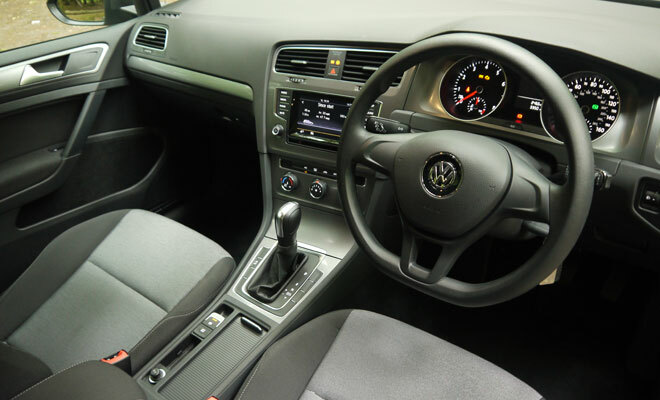 More expensive editions of the Golf such as the 2.0 TDI GT get selectable modes for the DSG gearshift – Economy, Comfort and Sport – but the one operating mode of the S-model’s gearbox provides a sensible middle way. The starting price without options for the 1.2 TSI with DSG is £19,575. 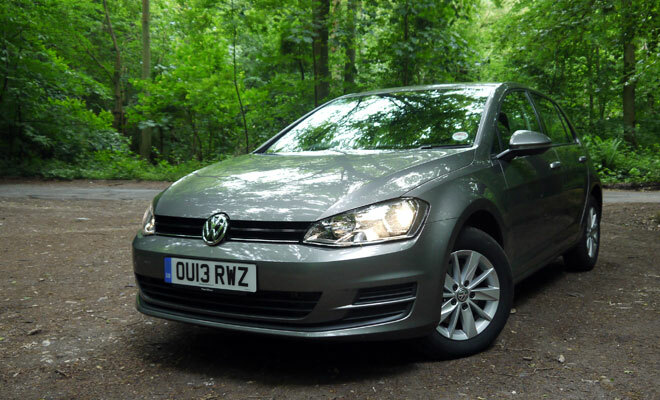 For this particular model of Volkswagen lease hire options should start at around £220 per month, while insurance shouldn’t break any banks given the group 11 rating. Upgrading from the standard 16-inch wheels to same-size alloys will add £420 and metallic paint another £525, both of which are probably sensible options for the sake of resale value. Running costs also ought to be modest. The official combined cycle economy is not at all bad for a petrol-powered car of this size at 56.5mpg, paired with CO2 emissions of 114g/km. 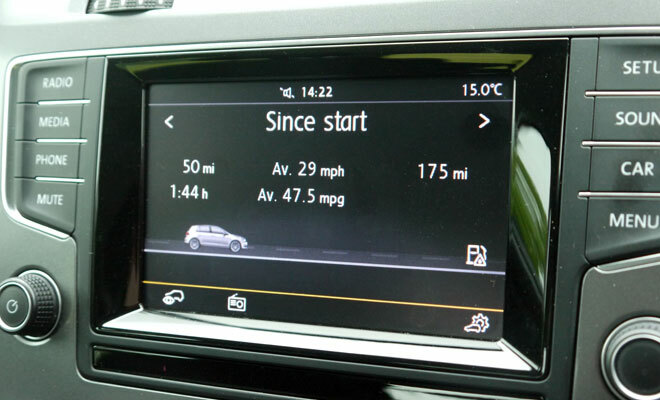 Across 50 miles of testing, including a few bouts of harsh acceleration, the car gave me 47.5mpg. That’s at least 5mpg better than I was expecting. The result is helped by VW’s BlueMotion technologies, such as an alternator that charges when the car is slowing down, reducing the general load on the engine. 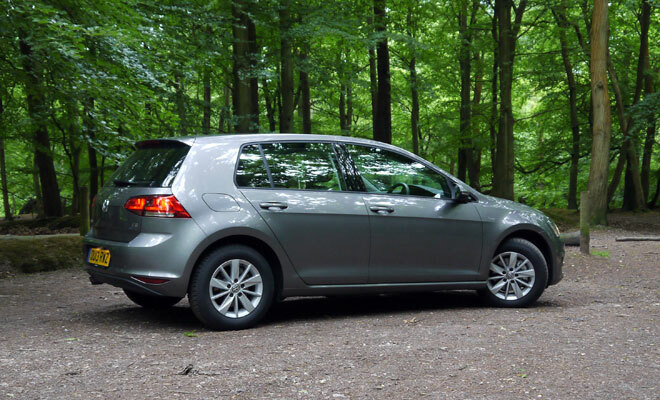 Lower powered editions of the Golf, below 120PS, get simplified twist-beam rear suspension. It may not be quite as agile as the fully independent alternative, but is a virtuous 15kg lighter. 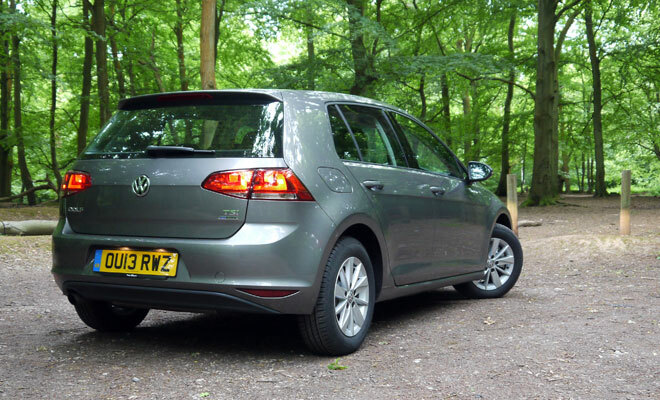 Out on a real road, the difference in handling compared to pricier Golfs is hard to spot. The S model feels light and responsive on back roads, and is well able to soak up ordinary lumps and bumps without skipping out of line on fast bends. The four-cylinder petrol engine is impressively smooth and quiet too, combining with the Golf’s well insulated cabin to give a very peaceful interior. The faint whoosh of air rushing around the screen pillars is often the loudest noise at cruising speeds. 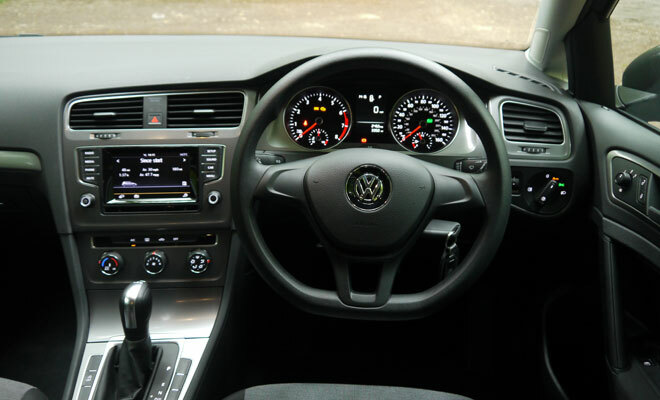 The interior is typical VW stuff – lots of touchy-feely plastics, controls that slide and click, and a general impression that everything will hang together without snapping for the life of the car. The centre console is beautifully built but perhaps a little dated and timid in design compared to the competition. The digital screen, for example, really ought to be level with the instruments rather than squashed down below the central air-vents. Entry level trim does mean a lot of blank buttons on the centre console, though there is one to deactivate the automatic engine stop-start facility, which is poised to save fuel by default. This system works well in concert with the auto-hold mode of the electronic handbrake. Set to auto-hold, you can step off the brake at a standstill without reigniting the engine, which leaps into life when you brush the throttle. Every new Golf now gets a central 5.8-inch colour touchscreen, complete with the eerie ability to pop options onto the screen a moment before your finger arrives. There’s no satnav by default but there is a DAB stereo with aux-in socket, slots for SD cards as well as CDs, plus an input port that comes fitted with an iPod cable. You’ll need to pay extra to get controls on the steering wheel, however. 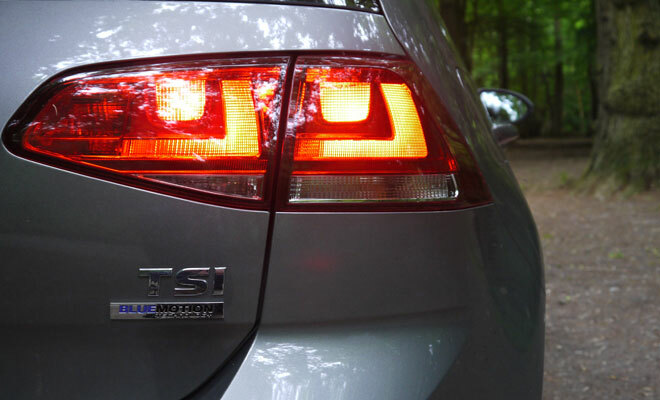 Despite providing one of the lowest rungs in the Golf ladder, the 1.2 TSI in S trim provides enough of the core qualities of the range to still feel special. I loved its combination of comfort, quality, price and practicality. And with such impressive real-world economy, it might even rank among the most appealing options in the entire Golf line-up.